That’s the title of my latest book which will take you all the way back to my beginning, through my early days in my hometown, Wilton, Connecticut, my barber shop days, broadcast careers, exciting time with the Seattle Seahawks and current ventures on the speaking circuit. Along the way, I’ve been fortunate enough to meet, interview, introduce and interact with many people – from the “man on the street” to mega movie and sports stars. Personal encounters with famous and not-so-famous revealed some little-known traits that in some cases spelled success; in others, unrealized dreams. But I’m happy to repeat what I stressed in my first two books that the love, guidance, values and steadfastness of my Mom and Dad have never left my conscience. And they still define who I am today. 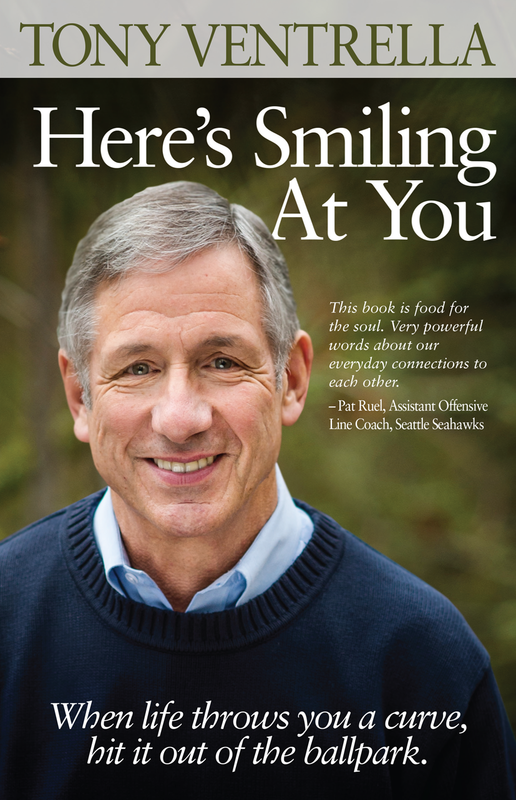 They have helped me recognize, admire and treasure the courage of so many covered in this book – from my little sister Bunny taken by cystic fibrosis to my childhood buddy John Corr, a casualty of the Viet Nam War; from an Indiana youngster named Rick to an 84-year-old marathon runner named Neil. The memories are plentiful and whether they made me laugh at my Uncle Ralph’s stand-up comedy or weep for my beloved Yankees’ World Series loss, in the end I always found a reason to smile. As I say in my subtitle: When life throws you a curve, hit it out of the ballpark. And Smile! Purchase "Here's Smiling At You" now on Amazon.com, Brick & Mortar Books in Redmond Town Center, Third Place Books in Lake Forest Park, Book Tree in Kirkland or indiebound.org.